Exposition - Site de mathieuhorrenberger ! 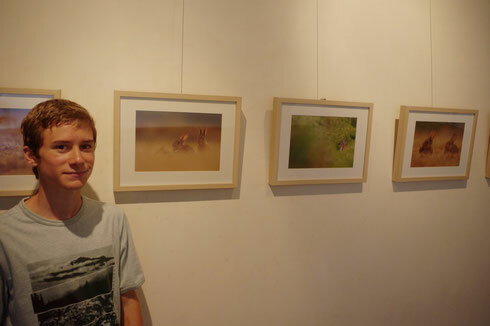 Aujourd'hui, c'était l'installation de l'expo photo à la médiathèque de Digne-les-Bains, dans le cadre du Festival Inventerre, sur le thème des mammifères. Elle sera visible du 8 juillet au 18 juillet aux horaires de la médiathèque. I am extremely impressed with your writing skills and also with the layout on your weblog. Is this a paid theme or did you modify it yourself? Either way keep up the nice quality writing, it is rare to see a nice blog like this one nowadays. Helpful info. Lucky me I discovered your site accidentally, and I'm surprised why this coincidence didn't happened in advance! I bookmarked it. Hey there! I know this is kind of off topic but I was wondering which blog platform are you using for this site? I'm getting tired of Wordpress because I've had issues with hackers and I'm looking at alternatives for another platform. I would be great if you could point me in the direction of a good platform. It's going to be finish of mine day, however before end I am reading this impressive paragraph to increase my experience. Hi there friends, how is all, and what you wish for to say concerning this article, in my view its genuinely remarkable designed for me. Wow, fantastic blog layout! How long have you been blogging for? you make blogging look easy. The whole look of your website is great, let alone the content material! You actually make it seem so easy with your presentation but I find this matter to be really something that I think I would never understand. It seems too complicated and very broad for me. I'm looking forward for your next post, I'll try to get the hang of it! Its like you read my mind! You seem to know so much about this, like you wrote the book in it or something. I think that you can do with some pics to drive the message home a little bit, but other than that, this is magnificent blog. An excellent read. I will certainly be back. Fine way of telling, and pleasant article to get facts on the topic of my presentation focus, which i am going to deliver in institution of higher education.